The war, which began in 2001, is not yet over. Though the Taliban were badly weakened at first, and numerous cities were taken by the allied troops, the conflict continues without any prospect of victory in sight. Public opinion is turning against the effort at a dizzying rate, not only among American citizens and the Western world in general, but in the upper echelons of political and military spheres. As for the Afghan population, it is barely holding on and increasingly in favour of negotiations with the Taliban in order to put an end to the suffering. While the transition from the Bush to the Obama administrations did ‘humanise’ the conflict, with the bodies of fallen soldiers being shown for the first time, there was no hiding the fact that the government faces the difficult task of defending a war still held to be ‘just’ while attempting to fin a dignified way out. In the meantime, Afghanistan has become an Islamic presidential republic (2005) that acknowledges equal rights for men and women under the law; at least two women must be elected to the lower house of Parliament; linguistic minorities are recognised, but the founding of parties based exclusively on ethnic, linguistic or religious groups is prohibited. Formally, that is. In actual fact, outside the capital city power continues to be held by religious leaders and assemblies of elders, hobbling the attempts at democracy by the official government led by Karzai. For most Afghans, rights exist only on paper, and the majority of women are victims of violence, often in the home, and deprived of any right to education or health. The Taliban militias have reorganised in the border zones with Pakistan (where it is believed that many al-Qaeda chiefs and militants are hiding under the protection of the Pakistani secret service), while, since 2003, the ISAF troops, soldiers from a total of 46 nations, operate under the command of NATO forces. Between 2007 to 2009 the number of civilian victims rises regrettably from year to year, reaching a total of more than five thousand dead, as compared to roughly a thousand military losses. The latest revelations – regarding American war diaries that were conveniently kept secret but revealed on the internet site Wikileaks in July of 2010 – unveil an even harsher reality. Massacres of innocents, unfaithful allies and inefficient strategies have added hundreds of more, previously unknown civilian victims to the list cite earlier, placing before the eyes of the entire world the true face of a dirty war in which the enemy is constantly gaining strength. 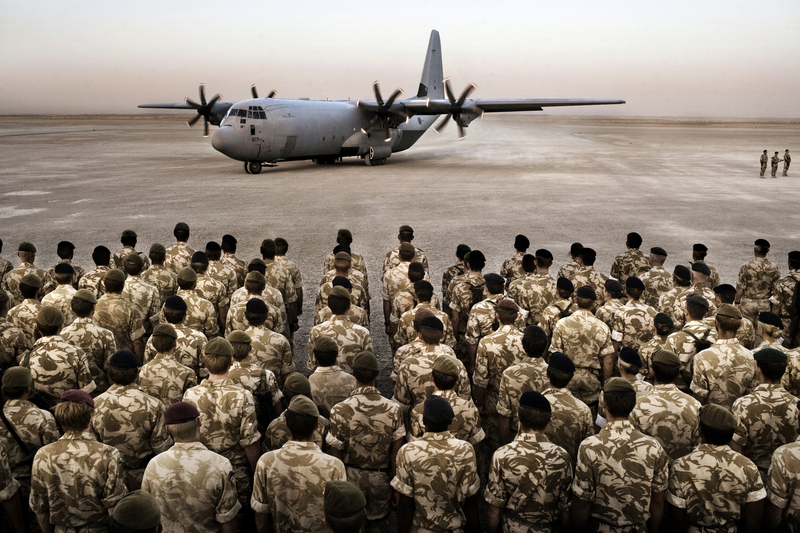 British Army soldiers and officers from various regiments lined up while a plane delivering the coffin of L/cpl Paul “Sandy” Sandford arrives during his Repatriation Ceremony in Camp Bastion. British troops from various regiments including the Worcestershire & Sherwood Foresters Regiment held a Repatriation Ceremony for L/cpl Paul “Sandy” Sandford, a British soldier from Worcestershire & Sherwood Foresters Regiment killed in action. 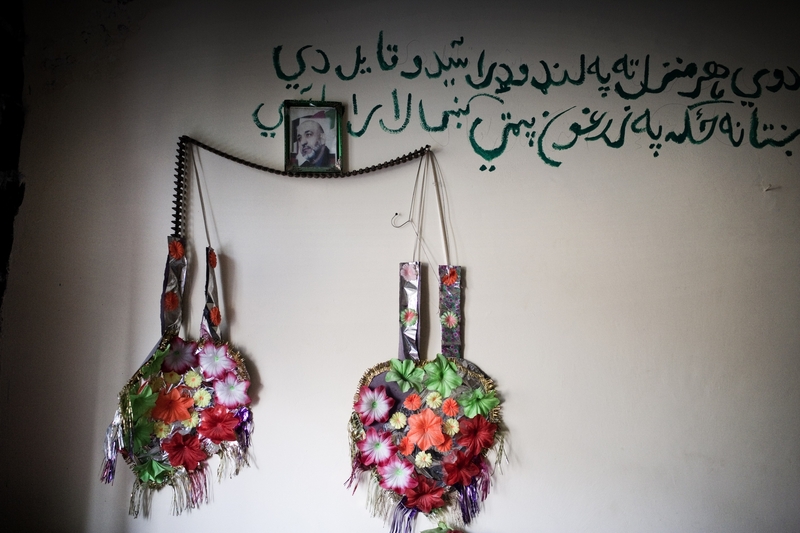 A portrait of Afghan President Hamid Karzai hangs on the wall in a Spera District polling center, during a mission to to provide security for the elections and to allow the HTT to interview Zadran tribesmen about tribal issues. The Human Terrain System, composed of several deployed Human Terrain Teams, is a US Army program that embeds civilian social scientists with combat units. The purpose of the program is to provide the military with relevant socio-cultural information in order to affect decision making and ensure that soldiers have a holisitic picture of their operating environment. The social scientists gather data by going into the field with soldiers and using traditional ethnographic methods of collection: interviewing, observation, and surveys. Human Terrain Team (HTT) Afghan One (AF1) is attached to 4-25th IN BCT, in Khost, Paktya, and Paktika provinces. Ted Callahan is an anthropologist on this team and has been investigating tribal disputes and marginalized tribal groups in Khost and Paktika. He had previously spent nearly two years living with a group of nomads in northern Afghanistan, doing his PhD dissertation research, where he learned to speak Dari and various Turkic languages. Using the 2009 Afghan Presidential and Parliamentary elections as a vehicle to get into the field, Callahan accompanied two Army mentoring units (the Embedded Training Team – ETT – and Police Mentor Team – PMT) based in Khost on several missions in Nader Shah Kot and Spera districts during the election period. The ETT and PMT were tasked with providing election security and mentoring their Afghanistan National Security Force (ANSF) counterparts. The election passed peacefully in Spera district, where the teams were stationed. Later, Callahan accompanied the Khost Provincial Reconstruction Team (PRT) to the southeastern part of Spera district, close to the Pakistani border, where nearly 6,000 refugees from North Waziristan, Pakistan, are living in temporary shelters. The PRT was observing the distribution of humanitarian aid by provincial authorities to the refugees. British Soldiers from the Grenadier Guards Regiment attend a briefing before a fighting patrol into Taliban territory at the Delhi Patrol Base (PB), in a location in the desert in the Garmsir District. The 3 Platoon Number Three Company Grenadier Guards conducted a Fighting Patrol into Taliban territory which included an ambush to destroy the enemy, the battlefield damage assessment was five to ten Taliban casualties. At least one of them was at a range of less than fifteen meters from within a Taliban trench. 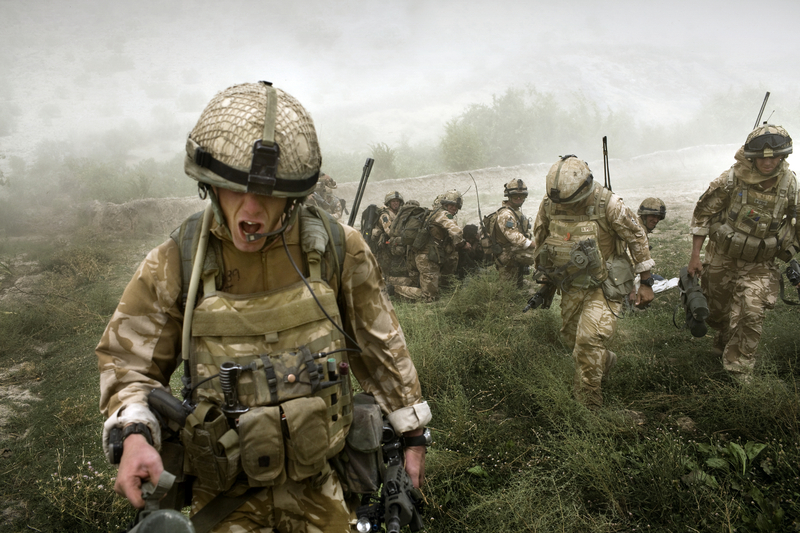 British troops are in the front line of the effort to suppress the Taliban insurgents and to regain control of southern Afghanistan, with the threat of a reinvigorated spring offensive from the militants looming large on the horizon. Explosions from mortars and artillery covering an operation of British Soldiers from the Grenadier Guards Regiment as they withdraw after attacking a Taliban insurgents compound near the Delhi Patrol Base (PB), in a location in the desert in the Garmsir District. 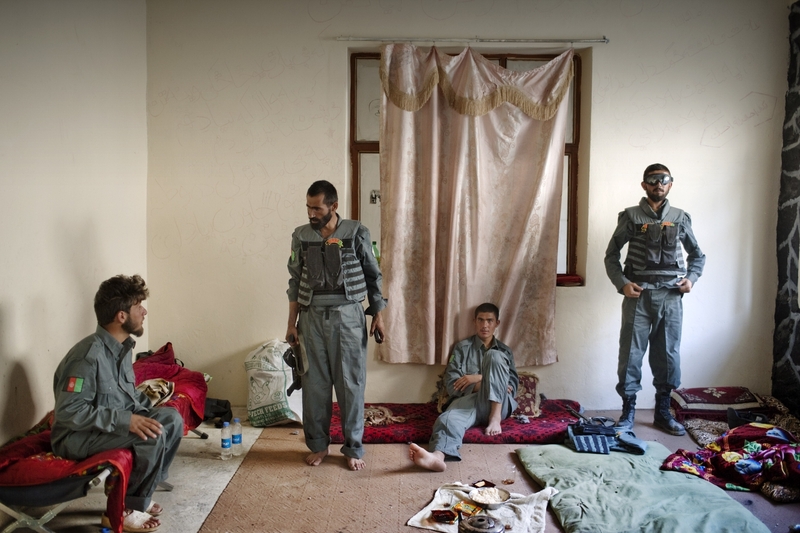 About ten soldiers rotate on a three day shift at the two security outposts of the base facing Taliban attacks on a daily basis and living in extremely hard conditions. British troops are in the front line of the effort to suppress Taliban insurgents to regain control of southern Afghanistan, with the threat of a reinvigorated spring offensive from the militants looming large on the horizon. An ANA ( Afghan National Army) Soldier conducting ” Operation Lastay Kulang” in Sangin Valley. British troops from The Inkerman Company, 1st Battalion Grenadier Guards, part of ISAF Task Force Helmand, are mentoring the Afghan National Army while conducting security operations on behalf of the Government of Afghanistan. ANA ( Afghan National Army) Soldiers conducting ” Operation Lastay Kulang” in Sangin Valley. British troops from The Inkerman Company, 1st Battalion Grenadier Guards, part of ISAF Task Force Helmand, are mentoring the Afghan National Army while conducting security operations on behalf of the Government of Afghanistan. Afghan National Police (ANP) officers during a mission to Spera District Center (DC), the location of a polling center, in order to provide security for the elections and to allow the HTT to interview Zadran tribesmen about tribal issues. The Human Terrain System, composed of several deployed Human Terrain Teams, is a US Army program that embeds civilian social scientists with combat units. The purpose of the program is to provide the military with relevant socio-cultural information in order to affect decision making and ensure that soldiers have a holisitic picture of their operating environment. The social scientists gather data by going into the field with soldiers and using traditional ethnographic methods of collection: interviewing, observation, and surveys. Human Terrain Team (HTT) Afghan One (AF1) is attached to 4-25th IN BCT, in Khost, Paktya, and Paktika provinces. Ted Callahan is an anthropologist on this team and has been investigating tribal disputes and marginalized tribal groups in Khost and Paktika. He had previously spent nearly two years living with a group of nomads in northern Afghanistan, doing his PhD dissertation research, where he learned to speak Dari and various Turkic languages. Using the 2009 Afghan Presidential and Parliamentary elections as a vehicle to get into the field, Callahan accompanied two Army mentoring units (the Embedded Training Team – ETT – and Police Mentor Team – PMT) based in Khost on several missions in Nader Shah Kot and Spera districts during the election period. The ETT and PMT were tasked with providing election security and mentoring their Afghanistan National Security Force (ANSF) counterparts. The election passed peacefully in Spera district, where the teams were stationed. Later, Callahan accompanied the Khost Provincial Reconstruction Team (PRT) to the southeastern part of Spera district, close to the Pakistani border, where nearly 6,000 refugees from North Waziristan, Pakistan, are living in temporary shelters. The PRT was observing the distribution of humanitarian aid by provincial authorities to the refugees. British paratroopers from 3rd Battalion The Parachute Regiment at Camp Eagle in the Zabul Province as they prepare to be deployed by Chinook helicopter into the Kandahar football stadium. British Paratroopers conducted operation “Daor Bukhou” by flying in hundreds of paratroopers from 3rd Battalion The Parachute Regiment into the football stadium of Kandahar City for the first time since 2001 to provide a presence in the city and support the Afghan National Security Forces in their battle against the Taliban. 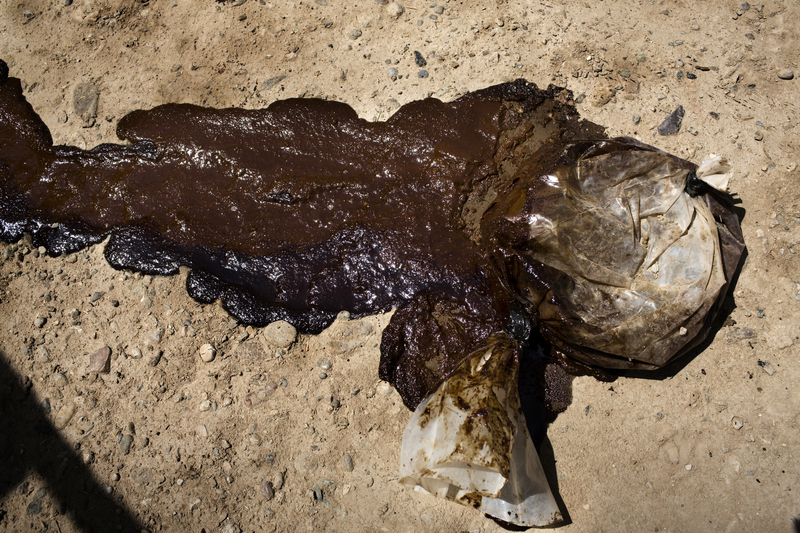 Opium leaking leaking on the ground during an operation in which British Army soldiers from the 3rd Battalion The Parachute Regiment seized about seventy kilograms of opium hiding in a car as well as some weapons, during strike operation “Southern Beast”. 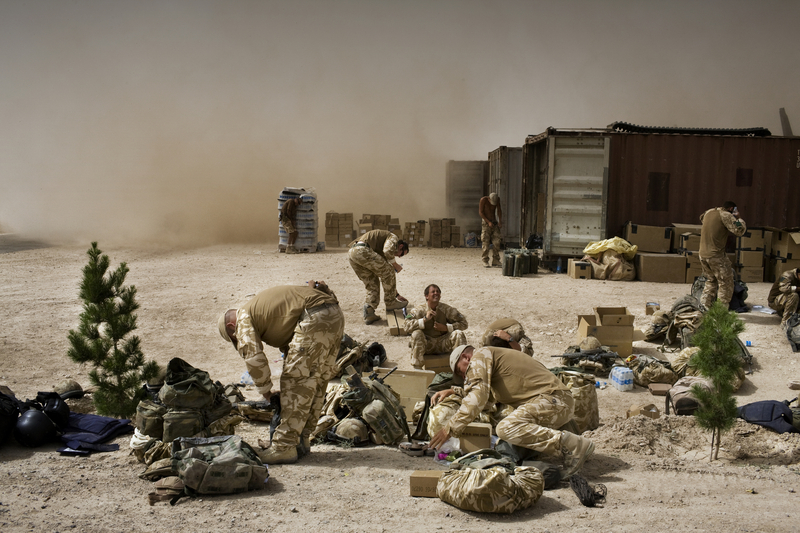 The British Army soldiers from the 3rd Battalion The Parachute Regiment spearheaded a strike operation in the Maywand District of the Kandahar Province, setting the conditions for a permanent ISAF presence to support the Afghan National Government in their fight against the Taliban. Striking within one of Afghanistan’s major opium producing areas the Paratroopers were looking for weapons, drugs, and individuals related to the Taliban. A British Soldier from the B Squadron of The Light Dragoons Regiment takes his first bath in two weeks in a location in the desert while conducting counter Taliban Operations. British Soldiers from the Light Dragons are living most of their six month tour in Afghanistan in extremely harsh conditions within their tanks. They operate without fresh food and limited water supplies in extremely high temperatures that can reach up to 65° C inside their tanks. 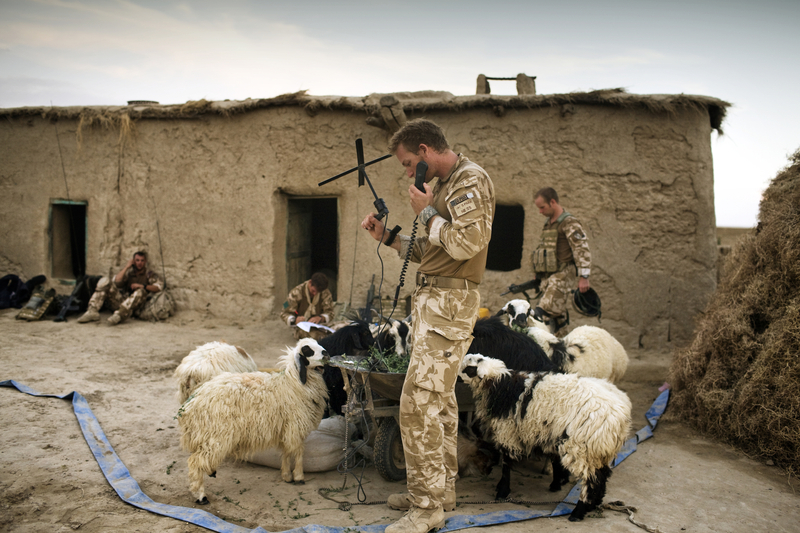 British troops are in the front line of the effort to suppress Taliban insurgents and to regain control of southern Afghanistan, with the threat of a reinvigorated spring offensive from the militants looming large on the horizon. From left, Corporal Paul Morgan attached to the Grenadier Guards Regiment and Lieutenant Daniel Knowles, a British Officer of the Royal engineers Regiment in a Taliban trench during a fighting patrol into Taliban territory outside the Delhi Patrol Base (PB), in a location in the Garmsir District. The 3 Platoon Number Three Company Grenadier Guards conducted a Fighting Patrol into Taliban territory which included an ambush to destroy the enemy, the battlefield damage assessment was five to ten Taliban casualties. At least one of them was at a range of less than fifteen meters from within a Taliban trench. British troops are in the front line of the effort to suppress Taliban insurgents and to regain control of southern Afghanistan, with the threat of a reinvigorated spring offensive from the militants looming large on the horizon. 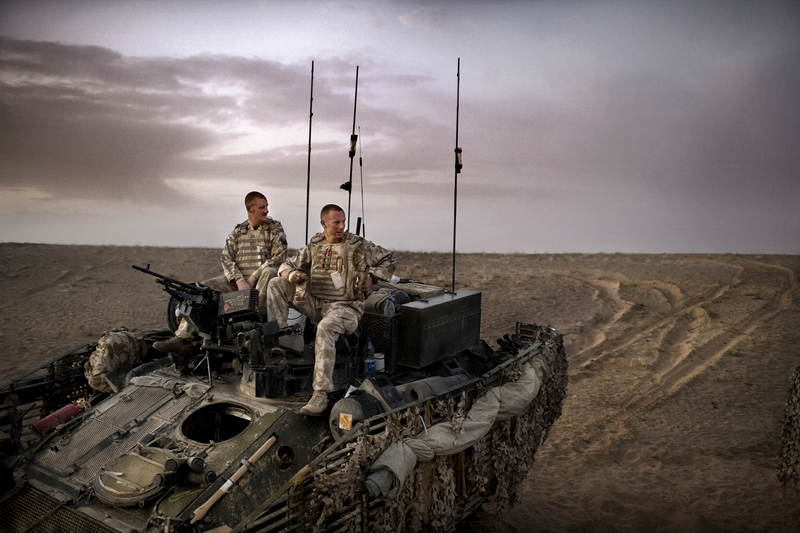 British Soldier from the B Squadron of The Light Dragons Regiment on their Spartan tank in the desert to conduct counter Taliban Operations. British troops are in the front line of the effort to suppress the Taliban insurgents and to regain control of southern Afghanistan, with the threat of a reinvigorated spring offensive from the militants looming large on the horizon. 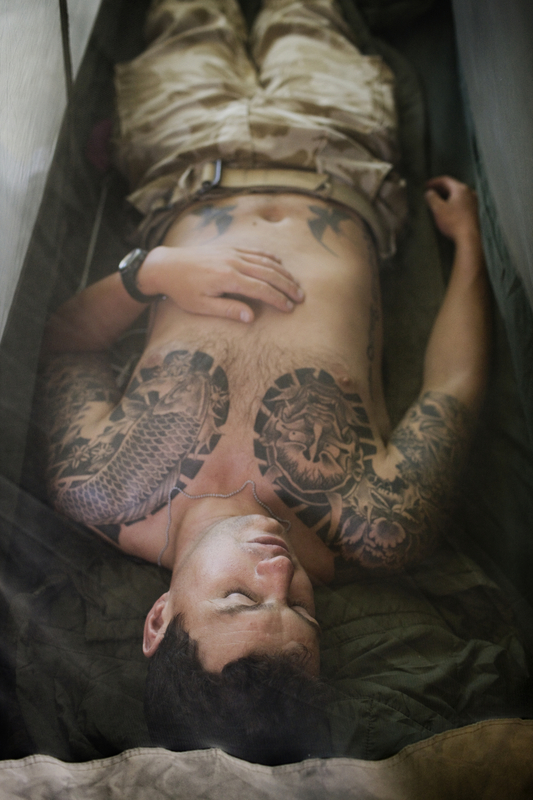 British paratrooper from 3rd Battalion The Parachute Regiment sleeps at his base in the Kandahar football stadium. British Paratroopers conducted operation ‘Daor Bukhou’ by flying in hundreds of paratroopers from 3rd Battalion The Parachute Regiment into the football stadium of Kandahar City for the first time since 2001 to provide a presence in the city in order to support the Afghan National Security Forces in their battle against the Taliban. 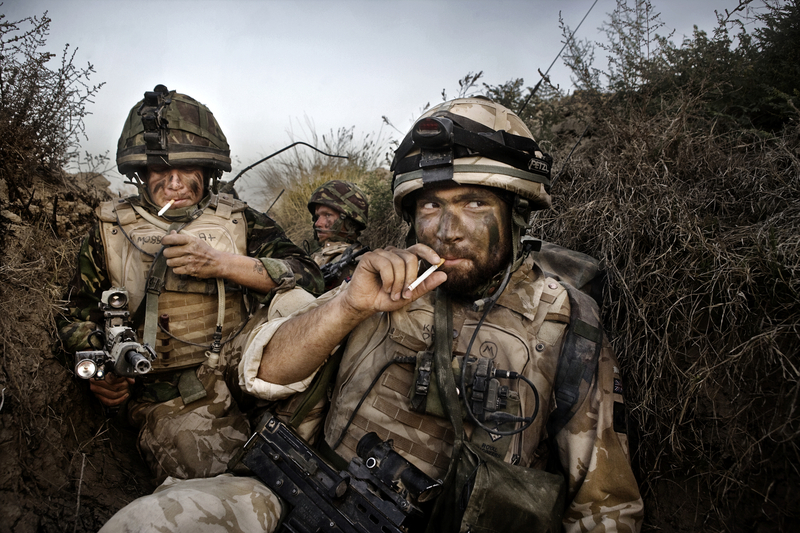 British Army soldiers from the 3rd Battalion The Parachute Regiment rest during strike operation “Southern Beast”. The British Army soldiers from the 3rd Battalion The Parachute Regiment spearheaded a strike operation in the Maywand District of Kandahar Province, setting the conditions for a permanent ISAF presence to support the Afghan National Government in their fight against the Taliban. Striking within one of Afghanistan’s major opium producing areas the Paratroopers were looking for weapons, drugs, and individuals related to the Taliban. During the operation about seventy kilograms of opium were seized and some weapons were recovered. 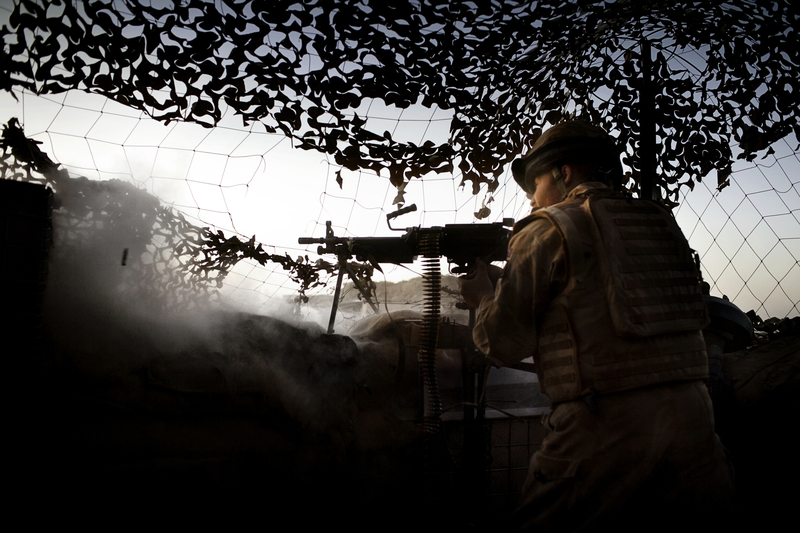 Guardsman Atherton, a British Soldier from the Grenadier Guards Regiment repels an assault by the Taliban insurgents at their combat security outpost at the Delhi Patrol Base (PB), in the Garmsir District. About ten soldiers rotate on a three day shift at the two security outposts of the base facing Taliban attacks on a daily bases and living in extremely hard conditions. British troops are in the front line of the effort to suppress the efforts of Taliban insurgents to regain control of southern Afghanistan, with the threat of a reinvigorated spring offensive from the militants looming large on the horizon. A helmet and rifle of an Afghan National Army soldier hanging on the wall in the Afghan National Army compound near the British Paratroopers from the 2nd Battalion The Parachute Regiment Gibraltar FOB (Forward Operating Base) in Helmand Province, Afghanistan. The British Paratroopers from the 2nd Battalion The Parachute Regiment are deployed in the Upper Gereshk Valley with the aim of supporting the Afghan National Government in their fight against the Taliban and providing security for the local nationals. US Army soldiers of B Company, 2nd Battalion,12th Infantry Regiment, 4th Brigade, 4th Infantry Division “Baker Company” are during an operation to secure a hill where there hasn’t been any prior US army presence. The Korengal valley, in the eastern frontier of Afghanistan, has become the stronghold of the Taliban fighters. In 2006, Coalition forces and the government of Afghanistan reclaimed the central lumber yard in the region and established the first government presence in the valley since before the Soviet Invasion. Since 2007 the valley has incurred heavy fighting between the Taliban and the U.S. military. Caught in the midst of this fighting are the 6 native Pashai tribes: Baba khel, Ghasu Khel, Langer Khel, Malik Khel, Mutiara Khel and Kathee Khel. The valley is characterized by rocky mountains, blanketed with lush, green forests, therefore there is not enough agricultural land to sustain the population. However the local people manage to survive, mainly sustained by illegal and legal logging. With the renewed government presence legal timber trade has increased through the valley. The valley is desolate and the Korengal fighters are fierce, know the terrain and watch the Americans’ every move. The outpost, for the past five months has been home to the US Army soldiers from B Company, 2nd Battalion,12th Infantry Regiment, 4th Brigade, 4th Infantry Division of whom live in very poor conditions in an extremely harsh environment climbing mountains up to 6000 ft all day to patrol and fight the Taliban, sleeping in wooden barracks very often with no heat or running water. 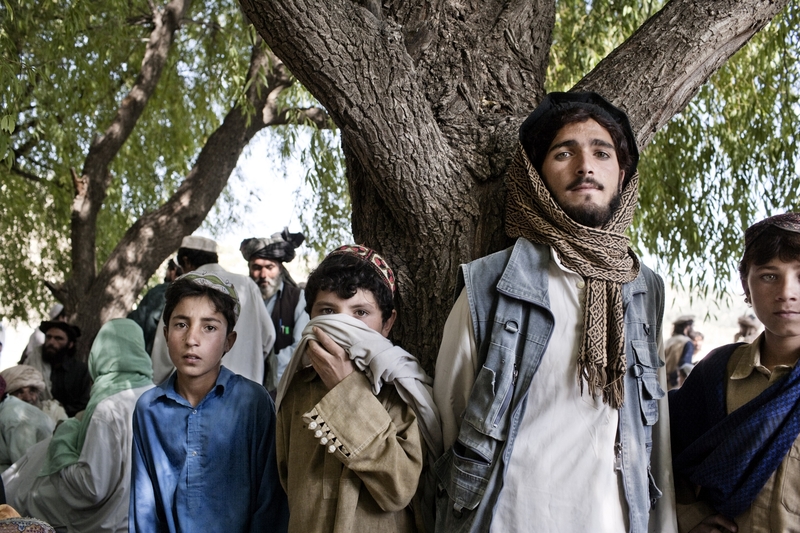 Their goal is to reconnect the Afghan villages of the valley to their government and provide security to the population. Despite the importance of the mission in the Korengal Valley, the outpost will most likely be closed in the beginning of 2010 as part of a new war strategy being implemented by the ISAF under the command of U.S. General McChrystal. 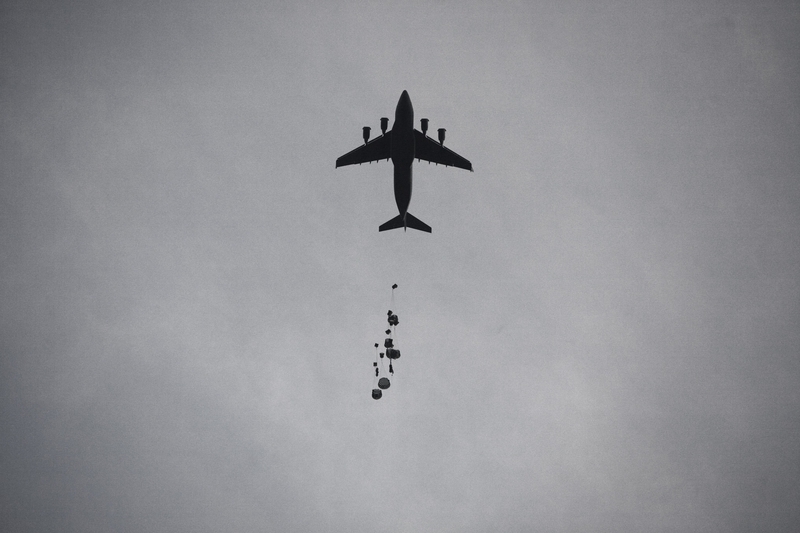 A US Air Force plane drops supplies of water and gasoline to the Army soldiers from B Company, 2nd Battalion,12th Infantry Regiment, 4th Brigade, 4th Infantry Division “Baker Company” living at the Korengal outpost. The only way to receive refueling of water, food, gasoline and ammunition it by air as there are no roads in the valley. 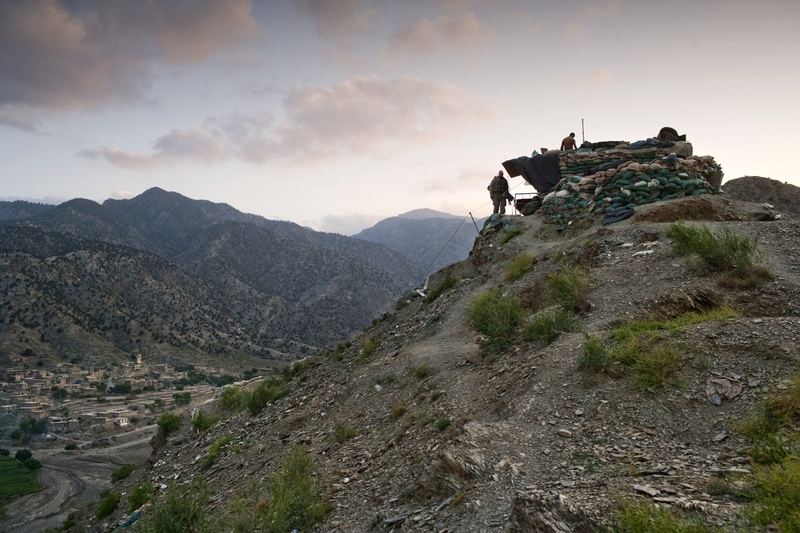 The Korengal valley, in the eastern frontier of Afghanistan, has become the stronghold of the Taliban fighters. In 2006, Coalition forces and the government of Afghanistan reclaimed the central lumber yard in the region and established the first government presence in the valley since before the Soviet Invasion. 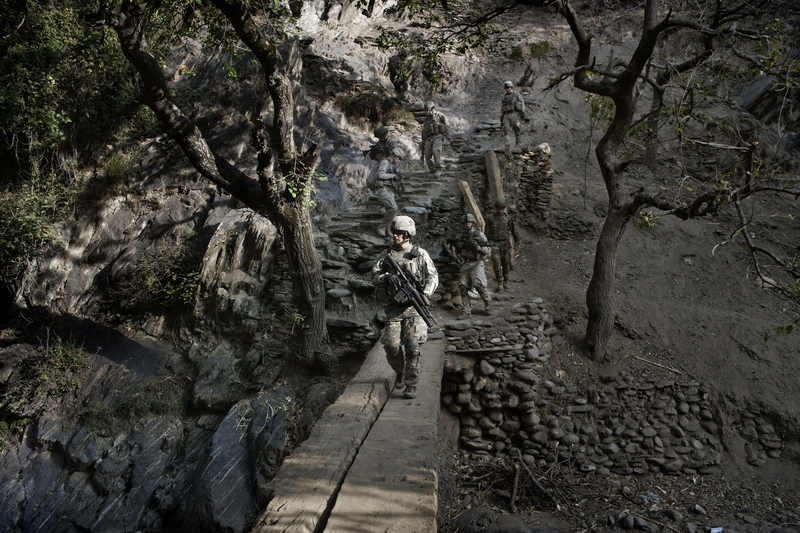 Since 2007 the valley has incurred heavy fighting between the Taliban and the U.S. military. Caught in the midst of this fighting are the 6 native Pashai tribes: Baba khel, Ghasu Khel, Langer Khel, Malik Khel, Mutiara Khel and Kathee Khel. The valley is characterized by rocky mountains, blanketed with lush, green forests, therefore there is not enough agricultural land to sustain the population. However the local people manage to survive, mainly sustained by illegal and legal logging. With the renewed government presence legal timber trade has increased through the valley. The valley is desolate and the Korengal fighters are fierce, know the terrain and watch the Americans’ every move. The outpost, for the past five months has been home to the US Army soldiers from B Company, 2nd Battalion,12th Infantry Regiment, 4th Brigade, 4th Infantry Division of whom live in very poor conditions in an extremely harsh environment climbing mountains up to 6000 ft all day to patrol and fight the Taliban, sleeping in wooden barracks very often with no heat or running water. Their goal is to reconnect the Afghan villages of the valley to their government and provide security to the population. Despite the importance of the mission in the Korengal Valley, the outpost will most likely be closed in the beginning of 2010 as part of a new war strategy being implemented by the ISAF under the command of U.S. General McChrystal. British Paratroopers from the 3rd Battalion The Parachute Regiment prepare to get on board of a Chinook helicopter to return to their base after they detained and capture same Taliban leaders. The 3rd Battalion The Parachute Regiment conducted a joint operation with U.S led Task Force Paladin and Afghan Border Police in the Kandahar Province to capture same Taliban leaders. According to the military, during the operation about eight Taliban were captured and detained. 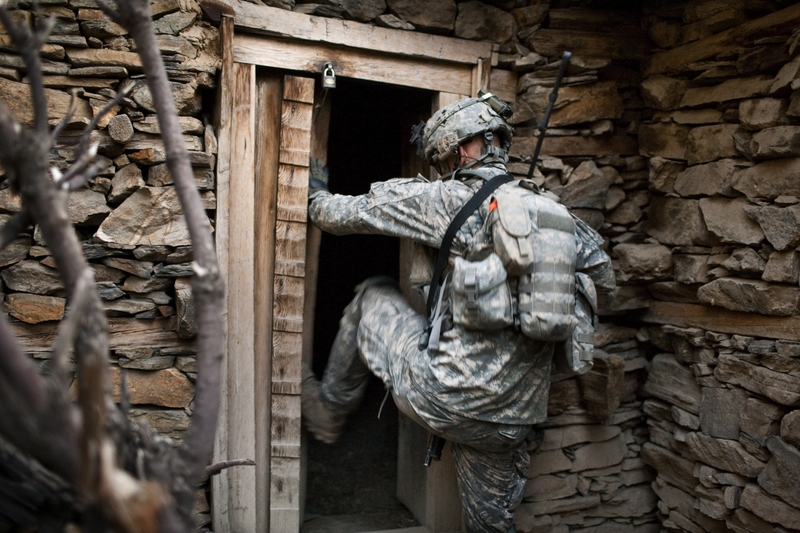 US Army officer from B Company, 2nd Battalion,12th Infantry Regiment, 4th Brigade, 4th Infantry Division “Baker Company” HQ Platoon 2LT Jonathan Schwarz, 23-years-old, from NY breaks into a house during an operation to secure the Korengal village. The Korengal valley, in the eastern frontier of Afghanistan, has become the stronghold of the Taliban fighters. In 2006, Coalition forces and the government of Afghanistan reclaimed the central lumber yard in the region and established the first government presence in the valley since before the Soviet Invasion. 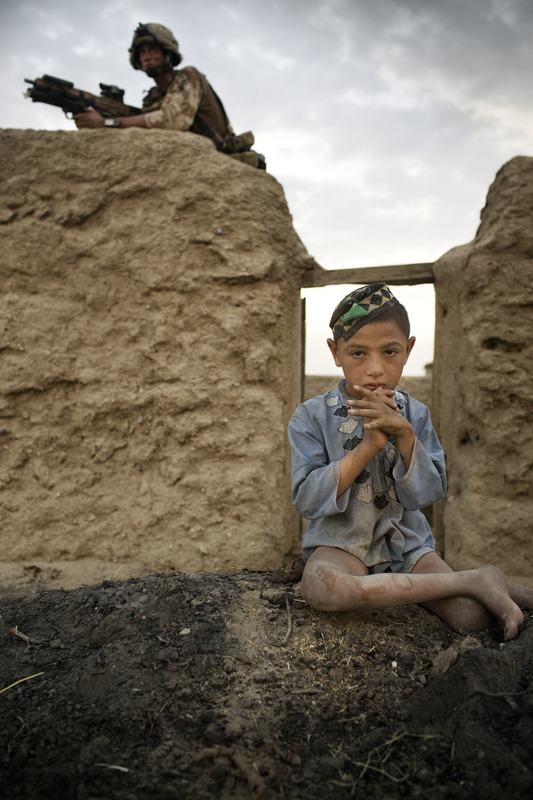 Since 2007 the valley has incurred heavy fighting between the Taliban and the U.S. military. Caught in the midst of this fighting are the 6 native Pashai tribes: Baba khel, Ghasu Khel, Langer Khel, Malik Khel, Mutiara Khel and Kathee Khel. The valley is characterized by rocky mountains, blanketed with lush, green forests, therefore there is not enough agricultural land to sustain the population. However the local people manage to survive, mainly sustained by illegal and legal logging. With the renewed government presence legal timber trade has increased through the valley. The valley is desolate and the Korengal fighters are fierce, know the terrain and watch the Americans’ every move. The outpost, for the past five months has been home to the US Army soldiers from B Company, 2nd Battalion,12th Infantry Regiment, 4th Brigade, 4th Infantry Division of whom live in very poor conditions in an extremely harsh environment climbing mountains up to 6000 ft all day to patrol and fight the Taliban, sleeping in wooden barracks very often with no heat or running water. Their goal is to reconnect the Afghan villages of the valley to their government and provide security to the population. Despite the importance of the mission in the Korengal Valley, the outpost will most likely be closed in the beginning of 2010 as part of a new war strategy being implemented by the ISAF under the command of U.S. General McChrystal. 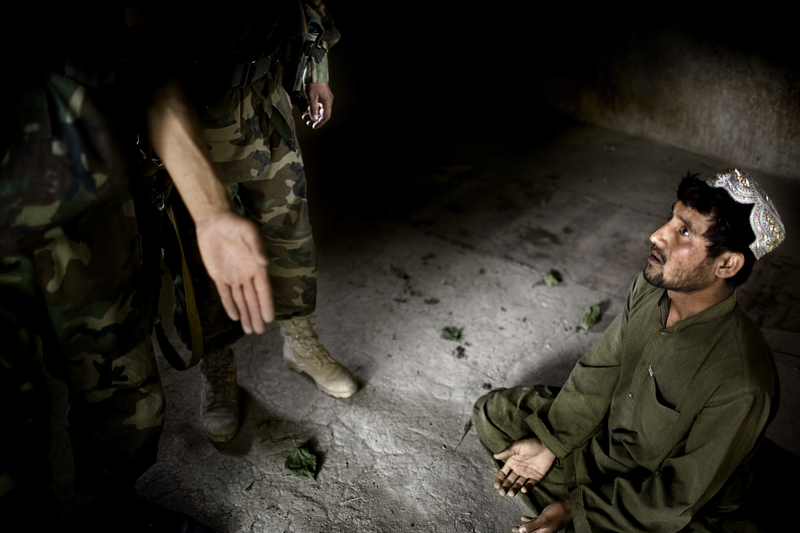 ANA ( Afghan National Army) Soldiers interrogate a suspected member of the Taliban, who was arrested and later released during “Lastay Kulang” Operation”. British troops from The Inkerman Company, 1st Battalion Grenadier Guards, part of ISAF Task Force Helmand, are mentoring the Afghan National Army while conducting security operations on behalf of the Government of Afghanistan in Helmand Province. Afghan and Pakistani refugees wait to be registered by the Afghan Head of Disaster Management Committee (DMC) and to receive aid distribution in Khost Province. HTT (Human Terrain Team) and PRT (Provincial Reconstruction Team) went to Spera to observe the distribution of humanitarian assistance to a group of approximately 600 families defined as persons of concern according to UNHCR, (United Nations High Commissioner for Refugees) as the area remains inaccessible to all humanitarian International organizations. According to UNHCR the group crossed into the Spera district of Afghanistan from North Waziristan Pakistan and UNHCR continues to profile the population to understand and define the reason of the infighting. Meantime, on humanitarian grounds the most vulnerable are assisted. The Human Terrain System, composed of several deployed Human Terrain Teams, is a US Army program that embeds civilian social scientists with combat units. The purpose of the program is to provide the military with relevant socio-cultural information in order to affect decision making and ensure that soldiers have a holisitic picture of their operating environment. The social scientists gather data by going into the field with soldiers and using traditional ethnographic methods of collection: interviewing, observation, and surveys. Human Terrain Team (HTT) Afghan One (AF1) is attached to 4-25th IN BCT, in Khost, Paktya, and Paktika provinces. Ted Callahan is an anthropologist on this team and has been investigating tribal disputes and marginalized tribal groups in Khost and Paktika. He had previously spent nearly two years living with a group of nomads in northern Afghanistan, doing his PhD dissertation research, where he learned to speak Dari and various Turkic languages. 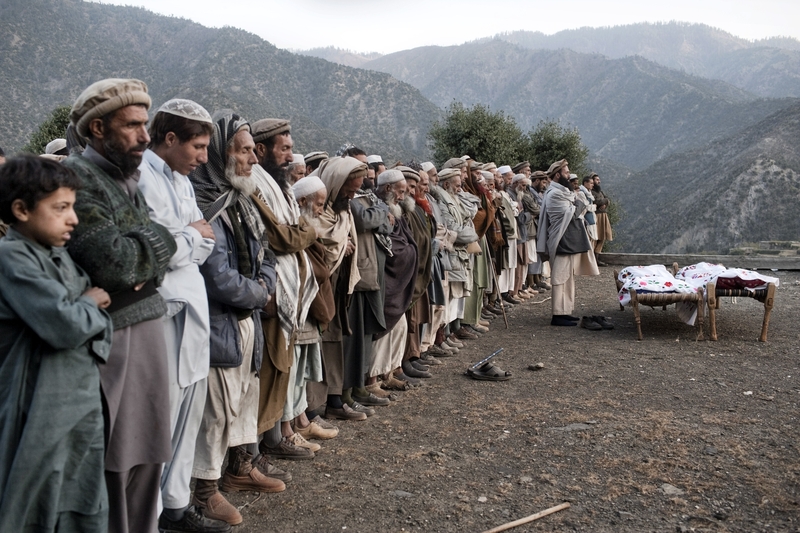 Using the 2009 Afghan Presidential and Parliamentary elections as a vehicle to get into the field, Callahan accompanied two Army mentoring units (the Embedded Training Team – ETT – and Police Mentor Team – PMT) based in Khost on several missions in Nader Shah Kot and Spera districts during the election period. The ETT and PMT were tasked with providing election security and mentoring their Afghanistan National Security Force (ANSF) counterparts. The election passed peacefully in Spera district, where the teams were stationed. Later, Callahan accompanied the Khost Provincial Reconstruction Team (PRT) to the southeastern part of Spera district, close to the Pakistani border, where nearly 6,000 refugees from North Waziristan, Pakistan, are living in temporary shelters. The PRT was observing the distribution of humanitarian aid by provincial authorities to the refugees. 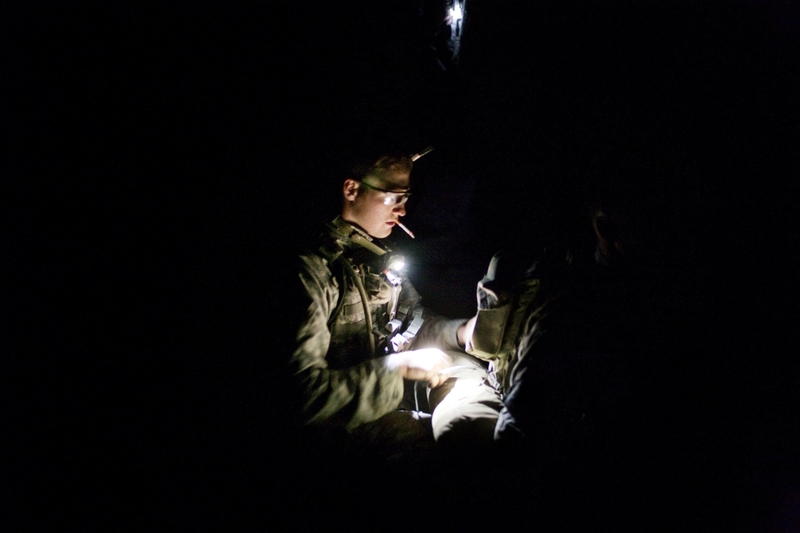 US Army soldiers from B Company, 2nd Battalion,12th Infantry Regiment, 4th Brigade, 4th Infantry Division “Baker Company” get ready for an operation in the middle of the night to secure the Korengal village. The Korengal valley, in the eastern frontier of Afghanistan, has become the stronghold of the Taliban fighters. In 2006, Coalition forces and the government of Afghanistan reclaimed the central lumber yard in the region and established the first government presence in the valley since before the Soviet Invasion. 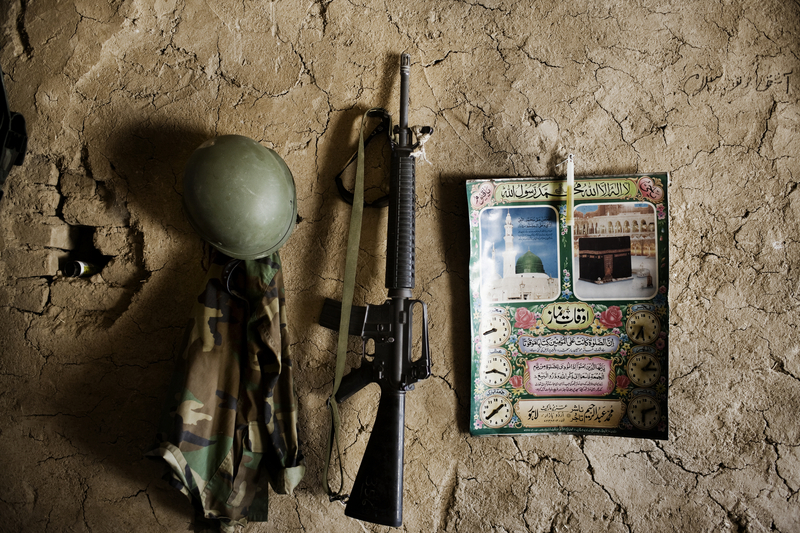 Since 2007 the valley has incurred heavy fighting between the Taliban and the U.S. military. Caught in the midst of this fighting are the 6 native Pashai tribes: Baba khel, Ghasu Khel, Langer Khel, Malik Khel, Mutiara Khel and Kathee Khel. The valley is characterized by rocky mountains, blanketed with lush, green forests, therefore there is not enough agricultural land to sustain the population. However the local people manage to survive, mainly sustained by illegal and legal logging. With the renewed government presence legal timber trade has increased through the valley. The valley is desolate and the Korengal fighters are fierce, know the terrain and watch the Americans’ every move. The outpost, for the past five months has been home to the US Army soldiers from B Company, 2nd Battalion,12th Infantry Regiment, 4th Brigade, 4th Infantry Division of whom live in very poor conditions in an extremely harsh environment climbing mountains up to 6000 ft all day to patrol and fight the Taliban, sleeping in wooden barracks very often with no heat or running water. Their goal is to reconnect the Afghan villages of the valley to their government and provide security to the population. Despite the importance of the mission in the Korengal Valley, the outpost will most likely be closed in the beginning of 2010 as part of a new war strategy being implemented by the ISAF under the command of U.S. General McChrystal. British Paratroopers from the 3rd Battalion The Parachute Regiment detain suspected Taliban. The 3rd Battalion The Parachute Regiment conducted a joint operation with U.S led Task Force Paladin and Afghan Border Police in the village of Segera in the Province of Kandahar to capture Taliban leaders. According to the military, during the operation about eight Taliban were captured and detained. British paratrooper from 3rd Battalion The Parachute Regiment Major Stue McDonald, 37-years-old from Colchester talks on the radio following a threat of suicide bomber attacks. British Paratroopers conducted operation ‘Daor Bukhou’ by flying in hundreds of paratroopers from 3rd Battalion The Parachute Regiment into the football stadium of Kandahar City for the first time since 2001 to provide a presence in the city and support the Afghan National Security Forces in their battle against the Taliban. US Army Soldiers from the Alpha Company 1/121 Infantry (L), 48th BCT) at their post on top of a mountain during a mission to Spera District Center (DC), the location of a polling center. The operation was conducted in order to provide security for the elections and to allow the HTT to interview Zadran tribesmen about tribal issues. The Human Terrain System, composed of several deployed Human Terrain Teams, is a US Army program that embeds civilian social scientists with combat units. The purpose of the program is to provide the military with relevant socio-cultural information in order to affect decision making and ensure that soldiers have a holisitic picture of their operating environment. The social scientists gather data by going into the field with soldiers and using traditional ethnographic methods of collection: interviewing, observation, and surveys. Human Terrain Team (HTT) Afghan One (AF1) is attached to 4-25th IN BCT, in Khost, Paktya, and Paktika provinces. Ted Callahan is an anthropologist on this team and has been investigating tribal disputes and marginalized tribal groups in Khost and Paktika. He had previously spent nearly two years living with a group of nomads in northern Afghanistan, doing his PhD dissertation research, where he learned to speak Dari and various Turkic languages. Using the 2009 Afghan Presidential and Parliamentary elections as a vehicle to get into the field, Callahan accompanied two Army mentoring units (the Embedded Training Team – ETT – and Police Mentor Team – PMT) based in Khost on several missions in Nader Shah Kot and Spera districts during the election period. The ETT and PMT were tasked with providing election security and mentoring their Afghanistan National Security Force (ANSF) counterparts. The election passed peacefully in Spera district, where the teams were stationed. Later, Callahan accompanied the Khost Provincial Reconstruction Team (PRT) to the southeastern part of Spera district, close to the Pakistani border, where nearly 6,000 refugees from North Waziristan, Pakistan, are living in temporary shelters. The PRT was observing the distribution of humanitarian aid by provincial authorities to the refugees. 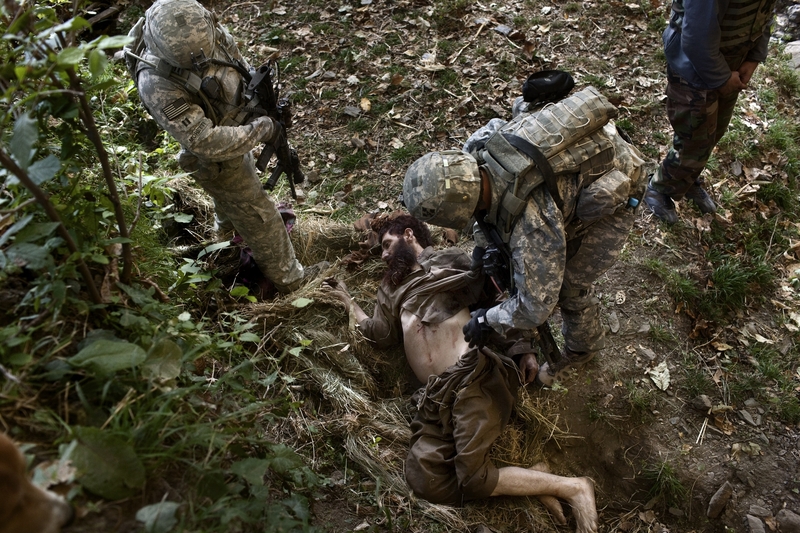 Two afghan villagers are brought back blindfolded to the outpost by US Army soldiers of B Company, 2nd Battalion,12th Infantry Regiment, 4th Brigade, 4th Infantry Division “Baker Company”. They are being held in the gym to be questioned regarding an explosion that occurred in the nearby village and that killed two children and wounded one. The Afghans were blindfolded in order not to know the location of the U.S. Army outpost. An Afghan child, approximately 6-years-old was brought in by afghan villagers to the Korengal Outpost with serious wounds to his legs and abdomen, and once treated by the medics of the US army at the Korengal Outpost he was then evacuated by helicopter to a better facility. The US Army Commanding officer of the Korengal outpost was informed that in the same incident two other children had lost their lives and that the funerals would be held that same day in the nearby village. He decided to send a patrol to raid the village after the funeral to inquire about the incident, suspecting that it was that the Taliban were responsible. He speculated that they were preparing an Explosive Ordnance Disposal (EOD) to attack the US forces and that possibly while doing so, something went wrong and the device exploded wounding one child and killing the other two. Following the patrol sixteen Afghan villagers were brought back to the Korengal Outpost for questioning and four of them were held in custody overnight at the gym of the outpost. They were later released after their record was checked. No one has been able to determinate what really caused the death and the injury of the children. British Army soldier from the 3rd Battalion The Parachute Regiment Pte Craig Sharpe, 23 from Portsmouth protects a compound as an Afghan child looks on during strike operation “Southern Beast”. The British Army soldiers from the 3rd Battalion The Parachute Regiment spearheaded a strike operation in the Maywand District of the Kandahar Province, setting the conditions for a permanent ISAF presence to support the Afghan National Government in their fight against the Taliban. Striking within one of Afghanistan’s major opium producing areas the Paratroopers were looking for weapons, drugs, and individuals related to the Taliban. During the operation about seventy kilograms of opium were seized as well as some weapons. The US Army Commanding Officer of B Company, 2nd Battalion,12th Infantry Regiment, 4th Brigade, 4th Infantry Division “Baker Company” CPT Mark Moretti, 28-years-old, from NY (C) looks at what is believed to be a Taliban fighter, according to the commanding officer. He died a few moments after he had been shot above his hips by a US army sniper during an operation to secure the Korengal village. The Korengal valley, in the eastern frontier of Afghanistan, has become the stronghold of the Taliban fighters. In 2006, Coalition forces and the government of Afghanistan reclaimed the central lumber yard in the region and established the first government presence in the valley since before the Soviet Invasion. 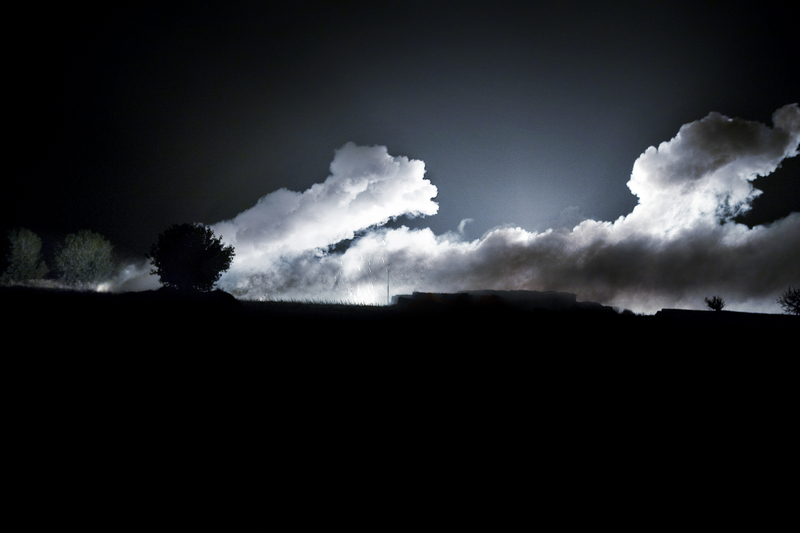 Since 2007 the valley has incurred heavy fighting between the Taliban and the U.S. military. Caught in the midst of this fighting are the 6 native Pashai tribes: Baba khel, Ghasu Khel, Langer Khel, Malik Khel, Mutiara Khel and Kathee Khel. The valley is characterized by rocky mountains, blanketed with lush, green forests, therefore there is not enough agricultural land to sustain the population. However the local people manage to survive, mainly sustained by illegal and legal logging. With the renewed government presence legal timber trade has increased through the valley. The valley is desolate and the Korengal fighters are fierce, know the terrain and watch the Americans’ every move. The outpost, for the past five months has been home to the US Army soldiers from B Company, 2nd Battalion,12th Infantry Regiment, 4th Brigade, 4th Infantry Division of whom live in very poor conditions in an extremely harsh environment climbing mountains up to 6000 ft all day to patrol and fight the Taliban, sleeping in wooden barracks very often with no heat or running water. Their goal is to reconnect the Afghan villages of the valley to their government and provide security to the population. Despite the importance of the mission in the Korengal Valley, the outpost will most likely be closed in the beginning of 2010 as part of a new war strategy being implemented by the ISAF under the command of U.S. General McChrystal. Two makeshift stretchers with the bodies of two children killed during an explosion are carried out during their funeral as US Army soldiers of B Company, 2nd Battalion,12th Infantry Regiment, 4th Brigade, 4th Infantry Division “Baker Company” investigate the incident. An Afghan child, approximately 6-years-old was brought in by afghan villagers to the Korengal Outpost with serious wounds to his legs and abdomen, and once treated by the medics of the US army at the Korengal Outpost he was then evacuated by helicopter to a better facility. The US Army Commanding officer of the Korengal outpost was informed that in the same incident two other children had lost their lives and that the funerals would be held that same day in the nearby village. He decided to send a patrol to raid the village after the funeral to inquire about the incident, suspecting that it was that the Taliban were responsible. He speculated that they were preparing an Explosive Ordnance Disposal (EOD) to attack the US forces and that possibly while doing so, something went wrong and the device exploded wounding one child and killing the other two. 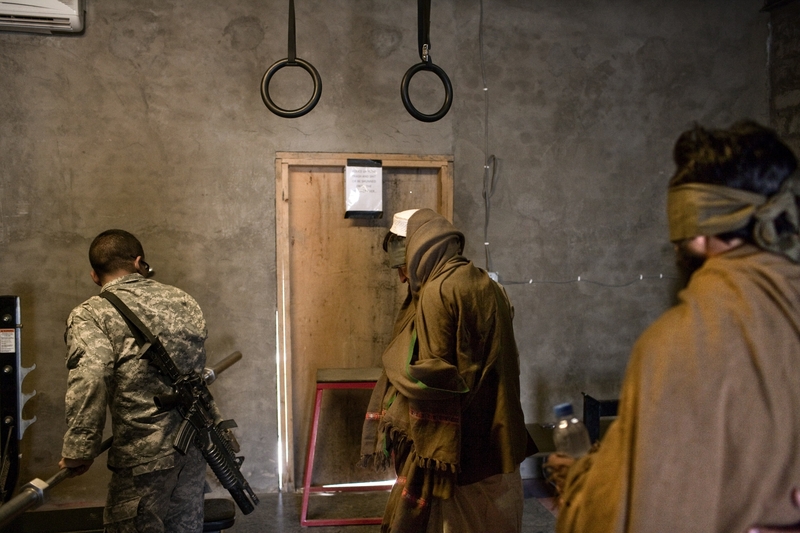 Following the patrol sixteen Afghan villagers were brought back to the Korengal Outpost for questioning and four of them were held in custody overnight at the gym of the outpost. They were later released after their record was checked. No one has been able to determinate what really caused the death and the injury of the children. The Korengal valley, in the eastern frontier of Afghanistan, has become the stronghold of the Taliban fighters. In 2006, Coalition forces and the government of Afghanistan reclaimed the central lumber yard in the region and established the first government presence in the valley since before the Soviet Invasion. 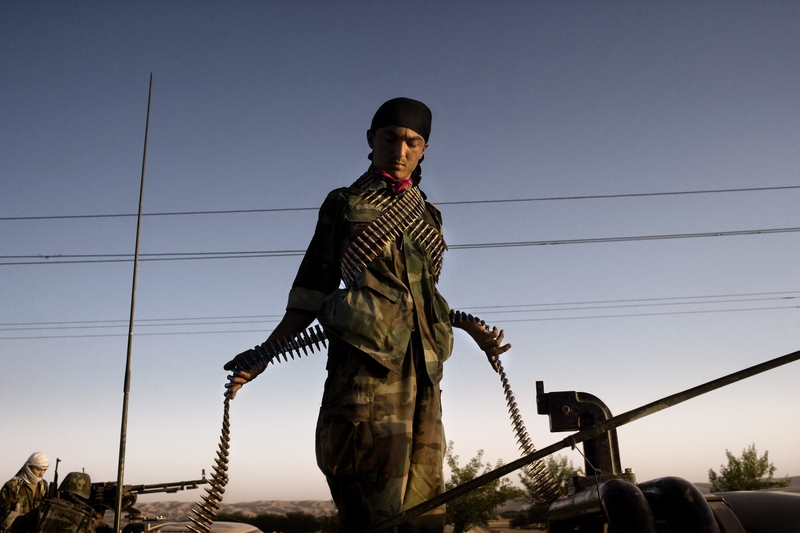 Since 2007 the valley has incurred heavy fighting between the Taliban and the U.S. military. Caught in the midst of this fighting are the 6 native Pashai tribes: Baba khel, Ghasu Khel, Langer Khel, Malik Khel, Mutiara Khel and Kathee Khel. The valley is characterized by rocky mountains, blanketed with lush, green forests, therefore there is not enough agricultural land to sustain the population. However the local people manage to survive, mainly sustained by illegal and legal logging. With the renewed government presence legal timber trade has increased through the valley. The valley is desolate and the Korengal fighters are fierce, know the terrain and watch the Americans’ every move. The outpost, for the past five months has been home to the US Army soldiers from B Company, 2nd Battalion,12th Infantry Regiment, 4th Brigade, 4th Infantry Division of whom live in very poor conditions in an extremely harsh environment climbing mountains up to 6000 ft all day to patrol and fight the Taliban, sleeping in wooden barracks very often with no heat or running water. Their goal is to reconnect the Afghan villages of the valley to their government and provide security to the population. Despite the importance of the mission in the Korengal Valley, the outpost will most likely be closed in the beginning of 2010 as part of a new war strategy being implemented by the ISAF under the command of U.S. General McChrystal. 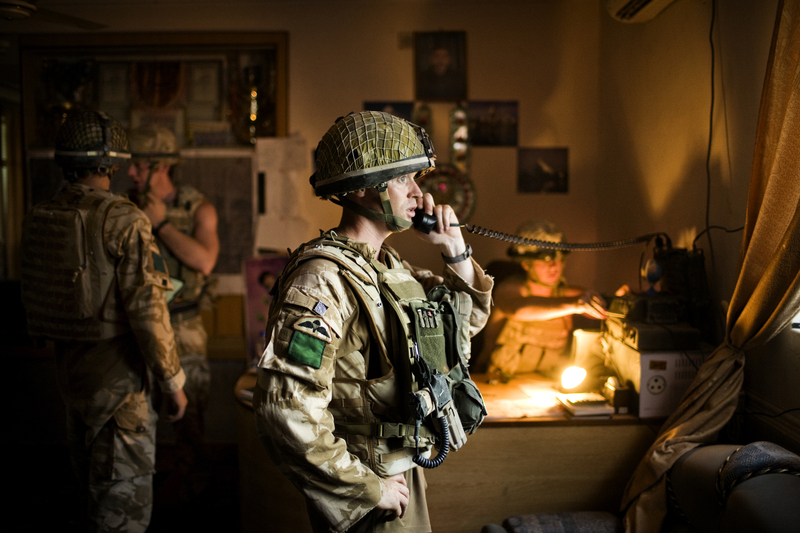 British Army soldier from the 3rd Battalion The Parachute Regiment Cpl Perran Berry, 31 from Aukland, New Zealand talks on the radio during strike operation “Southern Beast”. The British Army soldiers from the 3rd Battalion The Parachute Regiment spearheaded a strike operation in the Maywand District of Kandahar Province, setting the conditions for a permanent ISAF presence to support the Afghan National Government in their fight against the Taliban. Striking within one of Afghanistan’s major opium producing areas the Paratroopers were looking for weapons, drugs, and individuals related to the Taliban. During the operation about seventy kilograms of opium were seized as well as some weapons. 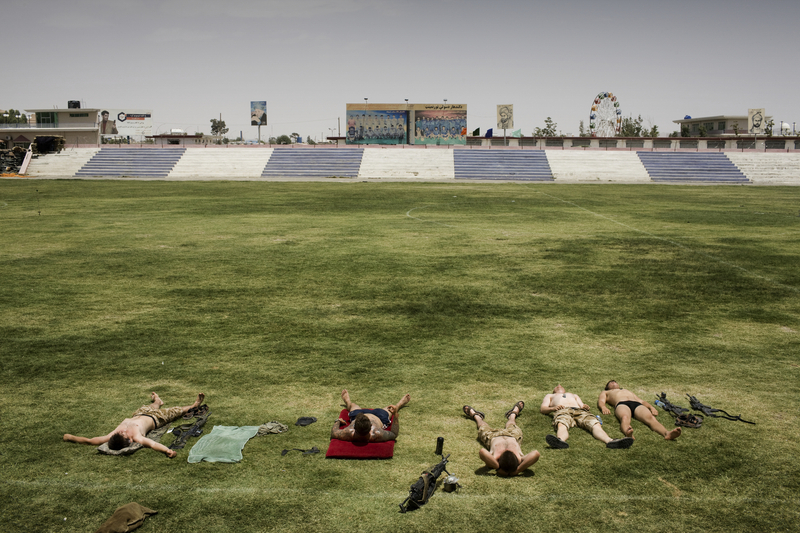 British paratroopers from 3rd Battalion The Parachute Regiment sun bath at their base in the Kandahar football stadium. British Paratroopers conducted operation ‘Daor Bukhou’ by flying hundreds of paratroopers from 3rd Battalion The Parachute Regiment into the football stadium of Kandahar City for the first time since 2001 to provide a presence in the city to support the Afghan National Security Forces in their battle against the Taliban. 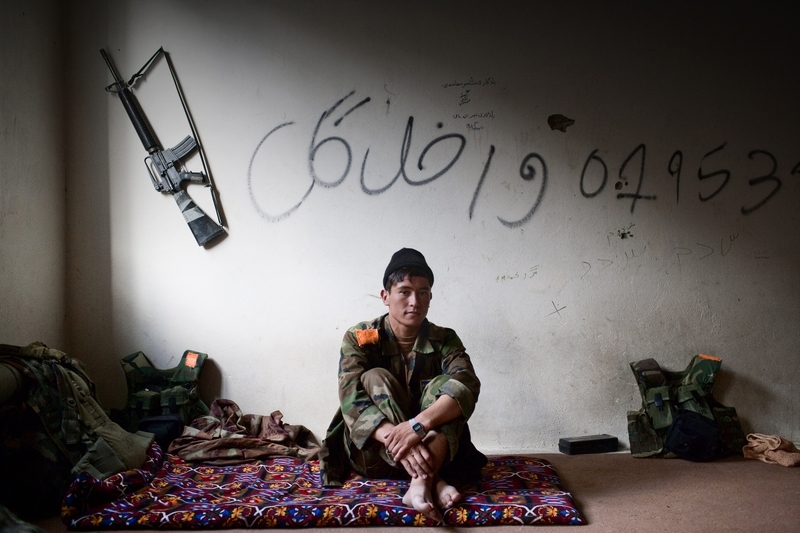 An Afghan National Army (ANA) soldier resting in his barracks during a mission to Spera District Center (DC), the location of a polling center. The operation was conducted in order to provide security for the elections and to allow the HTT to interview Zadran tribesmen about tribal. The Human Terrain System, composed of several deployed Human Terrain Teams, is a US Army program that embeds civilian social scientists with combat units. The purpose of the program is to provide the military with relevant socio-cultural information in order to affect decision making and ensure that soldiers have a holisitic picture of their operating environment. The social scientists gather data by going into the field with soldiers and using traditional ethnographic methods of collection: interviewing, observation, and surveys. Human Terrain Team (HTT) Afghan One (AF1) is attached to 4-25th IN BCT, in Khost, Paktya, and Paktika provinces. Ted Callahan is an anthropologist on this team and has been investigating tribal disputes and marginalized tribal groups in Khost and Paktika. He had previously spent nearly two years living with a group of nomads in northern Afghanistan, doing his PhD dissertation research, where he learned to speak Dari and various Turkic languages. Using the 2009 Afghan Presidential and Parliamentary elections as a vehicle to get into the field, Callahan accompanied two Army mentoring units (the Embedded Training Team – ETT – and Police Mentor Team – PMT) based in Khost on several missions in Nader Shah Kot and Spera districts during the election period. The ETT and PMT were tasked with providing election security and mentoring their Afghanistan National Security Force (ANSF) counterparts. The election passed peacefully in Spera district, where the teams were stationed. Later, Callahan accompanied the Khost Provincial Reconstruction Team (PRT) to the southeastern part of Spera district, close to the Pakistani border, where nearly 6,000 refugees from North Waziristan, Pakistan, are living in temporary shelters. The PRT was observing the distribution of humanitarian aid by provincial authorities to the refugees. 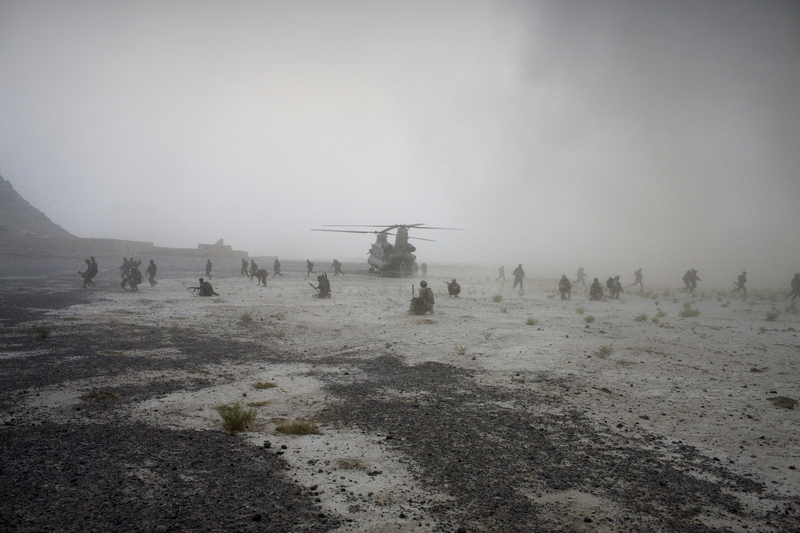 Members of the Afghan Security Forces and a Soldier from the Canadian led Task Force Kandahar, wait to be picked up by helicopter after an operation. The 3rd Battalion The Parachute Regiment conducted a joint operation with Canadian led Task Force Kandahar, U.S led Task Force Paladin, Afghan National Army (ANA) and Afghan National Police ANP) in the village of Salavat in the Province of Panjawi to search three compounds of which one was a mosque, to seize weapon cache and fight against the Taliban. According to the military, during the operation about ten Taliban were killed and two hundred pounds of explosives confiscated. British Paratroopers from the 3rd Battalion The Parachute Regiment deploy from royal Air Force Chinook Helicopter during an operation. The 3rd Battalion The Parachute Regiment conducted a joint operation with Canadian led Task Force Kandahar, U.S led Task Force Paladin, Afghan National Army (ANA) and Afghan National Police ANP) in the village of Salavat in the Province of Panjawi to search three compounds of which one was a mosque, to seize weapon cache and fight against the Taliban. According to the military, during the operation about ten Taliban were killed and two hundred pounds of explosives confiscated.